The cemetery is about 1 ¼ miles southeast of the Verona Cemetery and is not visible from the road. It is about 20 feet square and has a large cedar tree in the middle of it. It has a wrought-iron and wire fence that is partially fallen down. 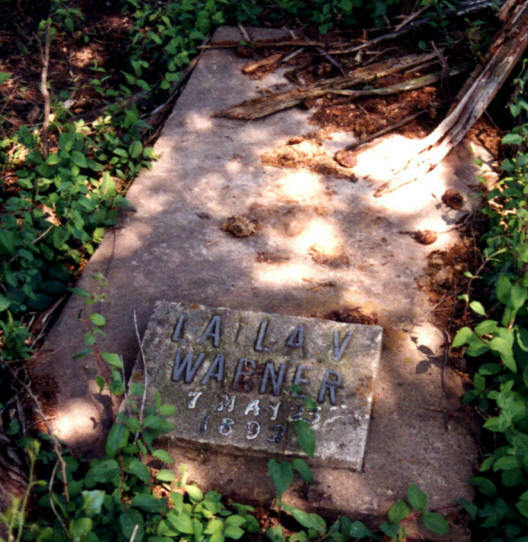 The cemetery contains five graves: Mr. and Mrs. Wells, their son and his wife, and a son-in-law. This cemetery is on 3 different properties. The Bill George family (the stock farm) owns the land on the front part of the cemetery. The back part is on the land of Weldon Hughes and the owner to the south. 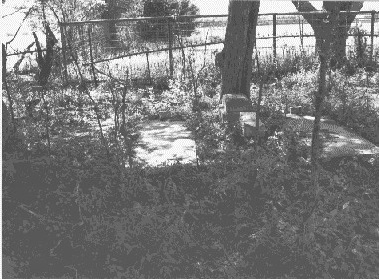 At one time Mr. George used the cemetery as a pen for his horse. When the relatives complained, he moved the horse. The relatives came in, and poured concrete over the top of the graves of Mr. and Mrs. Wells. Mr. Hughes is interested in getting the cemetery cleaned up. He says we can have access through his property. We would have to obtain permission from the relatives. The land in front of the cemetery on Mr. George's land is a pasture for horses and cows.